A huge caterpillar has reportedly rammed into as many as eleven buses in a community in Imo state. 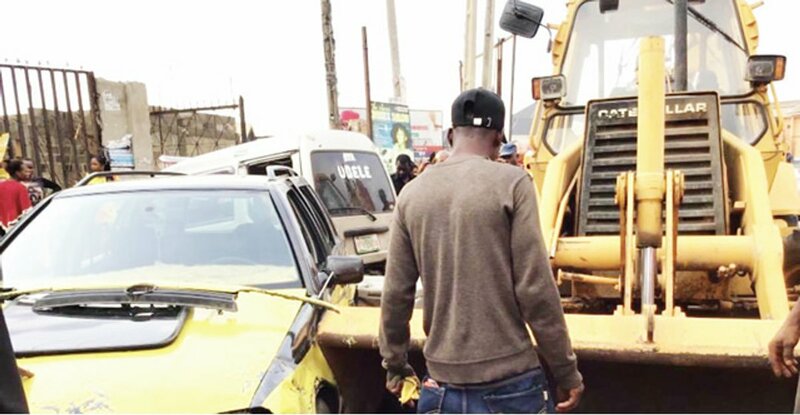 An eyewitness, Collins Ibe, told Southern City News that tragedy was averted because the driver of the caterpillar honked the horn of the heavy-duty vehicle and shouted when he saw that the brakes had failed. According to him, the alarm raised by the driver made people, including passengers, who were inside many of the buses to jump out and run for their lives. He said, “It is a miracle that the caterpillar did not kill people. It rammed into 11 buses and badly damaged them. If not for the alarm raised by the driver of the caterpillar, it would have been a serious tragedy. “You know that IMSU junction is a very busy place. There are a lot of commercial activities at the place. Apart from buying and selling of things, commercial drivers have created an emergency motor park there. “The caterpillar was going to town from the Okigwe Road area. As it approached the IMSU junction, which has a hill, the driver discovered that he lost control.